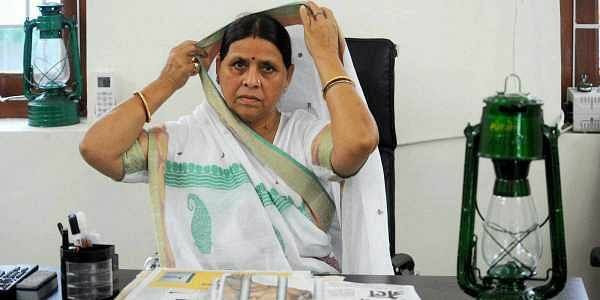 Former Bihar Chief Minister Rabri Devi has skipped appearance before Enforcement Directorate despite numerous summons in cases related to benami property. PATNA: Former Bihar Chief Minister Rabri Devi, who has so far skipped appearance before Enforcement Directorate despite numerous summons in cases related to benami property, today said she could not be "cowed down" by the central investigating agencies whose "character" she knew well. "Be it ED, CBI or IT (income tax) I know their tiriya charittar (character). What wrong have we done. The Centre should give an answer and so should the state government", she said while addressing the Rashtriya Janata Dal's national council here. "Let them send any number of notices. I am not going to get afraid. If they are so eager to interrogate me, then they should come to Patna and question me", she added. The ED stepped up after the Income Tax Department had questioned RJD chief Lalu Prasad's wife Rabri Devi and son Tejashwi Yadav in connection with alleged benami assets probe against them and others in Rs 1,000 crore land-for-hotels case in August last. Notwithstanding several summons issued to appear before it in Delhi, Rabri Devi has so far not shown before the ED. The former Bihar Chief Minister also reacted sharply to a comment by BJP state unit president Nityanand Rai, who had yesterday said that any hand or finger raised at Prime Minister Narendra Modi should be "broken or chopped off". "The BJP people speak a lot about chopping off of hands. Let them go ahead and convert their action into words if they have the courage to do so. But they should remember that there are many who are ready to respond in kind to their venerable Modi", she said. Raging controversy forced Rai to express regret and retract his comment saying he was making use of an idiom and his words were not to be taken literally.